Some earlier history of Swansea Mountain. In 1891, the mountain was known as Windermere Mountain. During that year, a trail was constructed to the summit to reach the copper mine owned by Brown, McVittie and Brewer. During that year some 50 tons of copper ore where packed down the trail by packhorses, carrying ordinary pack loads. At the Salmon Beds (Athalmer), the ore was shipped by barge to Golden, than by train to Vancouver and by sea to Wales. In spite of the circuitous route, the ore was mind at a profit. 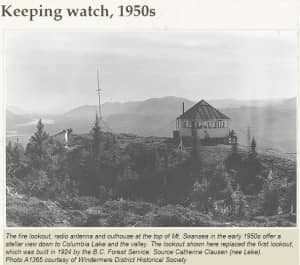 The lookout man was kept busy and he was in constant touch with the local forest service by telephone and later by radio. His radio reception was excellent, except during electrical storms. Tex Woods, a lookout man I once interviewed, told me electric storms were alarming. He said the hut had been hit a number of times. If he had to transmit during an electrical storm, he sat on a wooden chair, which had its legs in glass insulators. It was a time of great concern as every lightning flash was a potential forest fire. There have always been many visitors to the summit of Swansea for there the geography of the Valley below is spread like a map. The view is spectacular and well worth the effort in getting there. Winfried Weir was for 19 years the editor of the local newspaper and is since several years retired.